Romeo “Kade” Beorchia spends much of his free time in a study carrel at the Idaho Law Library in the U of I Boise Center. That's where the third-year law student says he spends eight to 12 hours a day preparing for his law degree. “It can be taxing, but every day when I look out the window I am reminded why I am here and where I am headed,” says Beorchia regarding the view of several of the top Boise law firms visible from the fifth-floor view at U of I Boise. 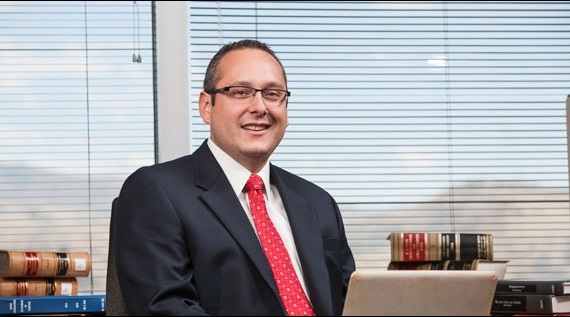 He credits the College of Law faculty, staff and alumni for helping provide student opportunities to network with successful, practicing attorneys — “experience I know will prove invaluable when it comes time to start my career in law,” he said. Kade Beorchia is an accomplished and determined U of I Law student. Beorchia was admitted to a number of other law schools, but scholarship support is why he chose to become a Vandal.